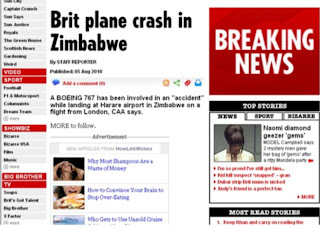 There's a blaring irony in the false news story issued from Zimbabwe yesterday that a Boeing 767 had crashed in Harare after having been hijacked from London. Airport authorities at Harare International created the fiction as part of a disaster drill using realistic conditions. "This Just In" on CNN, London's The Sun, and a German News Agency are a few of the media outlets that reported the accident. I don't know how to determine how many times the news was broadcast, tweeted or otherwise digitally distributed, but let's assume that those three news organizations were probably not alone. It is enough to say that the government of Zimbabwe did what governments always do, spin the media for their own purposes. The news media did, what it does these days, regurgitate the message with more concern for rapidity than veracity. I'm still chuckling over the comment of Gilles Lordet, from Reporters Without Borders who reportedly told the Associated Press, "This further discredits journalists, and encourages those who say journalists only flap their gums." 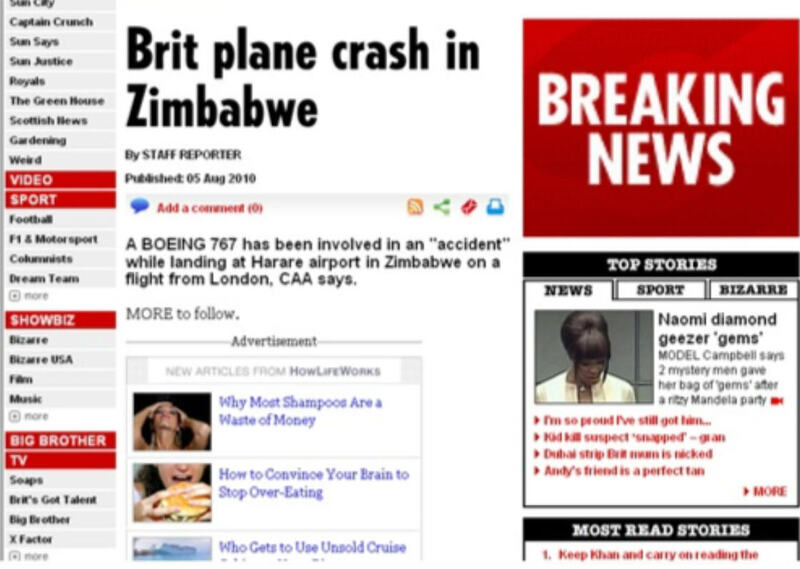 At the end of the day, Zimbabwe's Aviation chief, called the drill a success because "all our systems worked perfectly. Police, security and hospital staff reacted swiftly." That's the purpose of a drill after all, to practice response, analyze the results, see what works and what does not and learn from the experience. The irony is that journalists don't seem to have taken a moment to reflect on how they ended up "flapping their gums," as Lordet so eloquently put it. No, they are off and running with their ire at the Zimbabwean government for the deception. Don't get me wrong, I'm not endorsing government lying, I'm just not surprised by it. And journalists who have been around the block more than once shouldn't be surprised either. Looking back over this disaster drill, there are lessons that journalists would be wise to heed. It is sad that so many of today's journalists and editors as well, seem to freely ignore their obligation to accuracy in new reporting. Networks seem more concerned about "airing it first" rather than “airing it accurately.” What ever happened to the two source rule? Coverage today too often and regrettably lacks fact and relevance, and more often than not, news is reported out of context in the interest of gaining market share and baiting viewers and readers. Sadly, airlines remain a convenient whipping post for news media and consumer groups. A la carte pricing is a perfect example. I pay for extra cheese on my pizza; a premium for refreshments at the movies and at sports venues; more for extra cable channels; a fee for online access to some newspapers and magazines; shipping, handling and processing fees; and overabundance of taxes; add on fees when buying a new car; yet airlines are highly and overly criticized for charging extra for services consumed by its customers. They are further criticized for attempting to operate profitably. I would rather pay a lower fare and then pay for the services "I choose" to consume rather than paying a higher fare while subsidizing other passengers for the services they consume. No other industry, in my opinion is so regularly, poorly and neglectfully covered – a woeful commentary. And, no other deregulated industry is so highly scrutinized by government. Let me be sure I have this right. The working press are upset to find that they can't trust what they are told by official sources. I thought it was their job to NOT trust what they are told by official sources. Why is anyone surprised at this. I see students coming down the pipe all the time who Tweet before they think. Let's be serious though, the lack of attention to detail isn't just with journalists any longer. All aspects of life seem to be infected. Look at the folks who no longer want to fly, or become lawyers because those jobs doesn't pay enough and offer too few glamorous benefits. Now everyone wants a government job with a pension and security where they can make the news, not report it ... oh wait, that's how we got here, isn't it. You mean to tell me that you are suprised that people, companies, the media and governments lie?